Longrow Single Chardonnay Cask for Sweden – 16yo 54,6% ABV! The whisky is 16 years old, and when it comes to the time spent in cask it started out for seven years in a 1st-fill bourbon hogshead and was then "finished" for nine (!) years in a chardonnay cask (type of oak, number of fillings, and cask size unfortunately not stated). It was bottled at 54,6% ABV (which I assume is natural cask strength). The whisky was casked in october 2001 and bottled in march 2018. The chardonnay cask gave 380 bottles out of which 378 will be released as a web-launch at the swedish state monopoly this Thursday (20th of September). You can view the product by clicking here. Ok, I am ready to nose and taste, so let's go! When pouring this dram a really big and fat peat emmidiately fills the room… aah, wonderful! However, when nosing gently into the glass I come to the realisation that the peatyness is very, very soft, definitely boasting with creamyness; some kind of mix of vanilla cream and fat white chocolate at room temperature almost melting away (I’m absolutely drooling just thinking about it…). 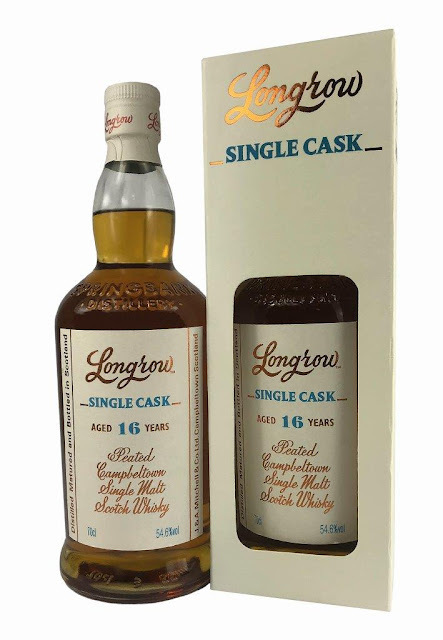 As is normally the case with Longrow, in my experience, the peatyness draws very much on old leather, old shoes, earthyness/something damp, and old barnhouse. Anyways, both the bourbon cask and the chardonnay have clearly set their resepective marks on this whisky; the creamy, fat, and distinct old vanilla from the bourbon, and something very ”red” (think redcurrant jam) and dry/tannins from the wine. There is no fight between the bourbon and the wine; actually, perfect balance in my opinion. But, hey, folks, the prevailing thing on the nose is definitely the charactheristic peatyness described above. Wow! This is really a really, really great dram, an excellent pick for the swedish market that will definitely satisfy both the peat-nerds and the ”sherry-esque”-nerds. It’s really hard to decide whether the nose or the taste is better than the other, but since I like drinking whisky my verdict shall be the taste ☺ An absolutely wonderful dram that tastes so much more than 16 years old. And hey, great price for a single cask, sláinte! Big thanks to the people at Symposion for the opportunity to try this release, and to be able to review it before the web launch. Please make sure to follow my FB-page by clicking here, my instagram by clicking here and my twitter-page by clicking here. Copyright © and All Rights Reserved on all tasting notes and text by SamuelWhisky and pictures likewise belong to SamuelWhisky, unless stated. If you would like to use any such material that belongs to SamuelWhisky or associated with SamuelWhisky, please ask by sending me an email to samuelkarlssonorebro [at] gmail [dot] com and by stating the source.